Fishing is one of those sports that can be enjoyed by almost any age or gender. 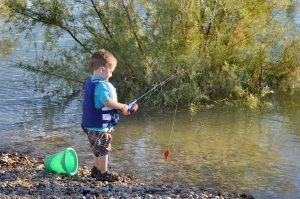 When it comes to the kids and a fishing it can provide many additional benefits aside from keeping them entertained. With the world of technology that we live in today, children on the whole have in some ways become physic ally lazy. They are more attached to the computers and cell phones then wanting to get out and learn something new that doesn’t involve the latest gadget. By introducing them to fishing they soon take an interest because of the challenge that it presents to them. Fishing also has the ability to be used as a learning tool. It provides an opportunity for adults to share a little bit of the history of fishing and how it can fit in to survival. Kids often find this intriguing and at the same time it allows adults to bond with the kids in a pleasant atmosphere while they’re getting to enjoy the outdoors. Many adult fishing enthusiasts became interested in this sport as a result of their childhood fishing experiences. It is something that has kept them interested throughout their growing years.